The Yes Anime booth at Toy Fair 2015, as the name implies, was chock full of anime inspired collectibles. However, they had some really great looking Harry Potter 1/6 Scale figures from Star Ace Collectibles on display. Star Ace is also releasing a Steve McQueen 1/6 Scale Figure. They also had their Samurai TMNT Vinyl figures, some Sponge Bob figures, and the Play Imaginative 1/4 Scale Super Alloy Superman and Batman Figures there. 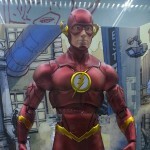 At San Diego Comic-Con 2014, the Yes Anime booth had some of the 1/4 scale and 1/6 scale Super Alloy Figures on display. 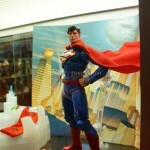 These figures, by Play Imaginative, are die-cast metal figures and included DC Comics New 52 versions of Superman and Batman. 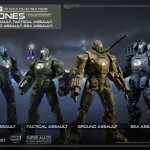 Also on display were Iron Man 2 War Machine and Iron Man 3 Iron Patriot. 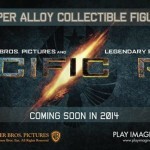 Play Imaginative has announced a new line of Super Alloy Pacific Rim Figures. For right now, they’ve only teased the banner and a release for 2014. So no word on if they will be available in their 1/6 or 1/12 scales (or both). We’ll have more info as it becomes available. The images continue to roll in from Yes Anime‘s booth, this time of the Play Imaginative DC New 52 assortment of figures by Play Imaginative. Included in the gallery are Batman, Superman, Green Lantern, Cyborg and Flash. The images highlight the interchangeable pieces included with each figure, making them even more worthwhile. You can check out the gallery and share your thoughts on these Yes Anime offerings after the jump. Now this is not only a surprising announcement, but has the potential to yield some amazing figures. Play Imaginative has announced that they will be producing 1/12 Scale Super Alloy Figures based on both the original Robocop and the upcoming Robocop reboot! With the nearly all metal approach that Play Imaginative has to their figures, I can’t think of a better license for them. The first figures are due in the first quarter of 2014. We’ll have more info as it becomes available. Jump into the ongoing discussion to let us know what you think. We’d like to thank the following for the photos; Open The Toys and Waylander.